Assignments Abroad Times is India’s leading newspaper for overseas jobs, published from the country’s commercial capital, Mumbai. From the humble beginning way back on February 27, 1993, the newspaper has come a long way. 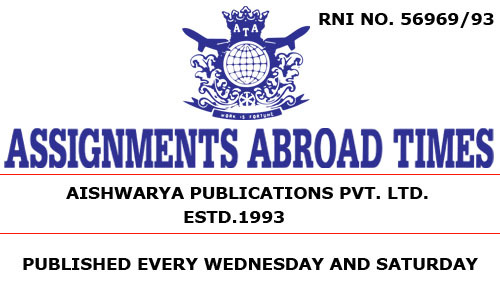 It is a matter of pride for Aishwarya Publications Pvt Ltd, publishers of Assignments Abroad Times, that over the years the group has become instrumental in sending lakhs of jobseekers to foreign destinations, especially to the Gulf countries. Assignments Abroad Times, started as a weekly newspaper, became a biweekly newspaper in a short span of four years is proof enough for the credibility of the group. Genuine ads and genuine news is the motto of the group. The newspaper is published on Wednesdays and Saturdays. It is available on news stands all over India. Moving with times, Assignments Abroad Times started its e-paper on January 1, 2014. And now with over 1,20,000 hits (Android app), the e-paper alone has a reach of over 6 lakh readership as of date. Assignments Abroad Times is an INS accredited bi-weekly newspaper. The newspaper reports project new trends and realities and dos and don’ts in overseas job markets, which help Indian jobseekers – both freshers and experienced – to find out their job destinations. Day-to-day developments in overseas employment market is updated regularly. Alterations and amendments in the rules pertaining to expatriates in different countries and immigration rules are also highlighted in the newspaper. Assignments Abroad Times is a true mediator between jobseekers and manpower exporters. The newspaper is the most sought after one for genuine, government-recognised recruiters. Professional manpower exporters who publish ads in the newspaper are indeed the strength of the group. The advertisers in the newspaper have diversified business activities in India and abroad. And the symbiotic relationship between the newspaper group and the recruiters helps smooth recruitment process. Overseas employers who wish to recruit Indians also have approved Assignments Abroad Times as their media of choice to source their manpower requirements. Aishwarya Publications is headed by Mr NRK Pillai. Mr Pillai, who has over 14 years experience in the Times of India Group, is the Publisher and Editor of Assignments Abroad Times.